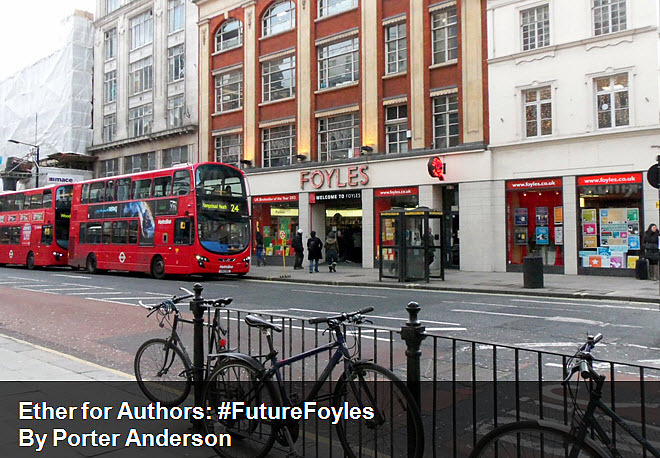 #FutureFoyles: “What Bookstores Do Best”—or Do They? Here is one thing no one will deny about the events hashtagged #FutureFoyles in London: here was unabashed dedication, enthusiasm, love and hope — loud, rackety, even strident love and hope — all transacted in a joyous din under the beams of Foyles’ third-floor gallery. 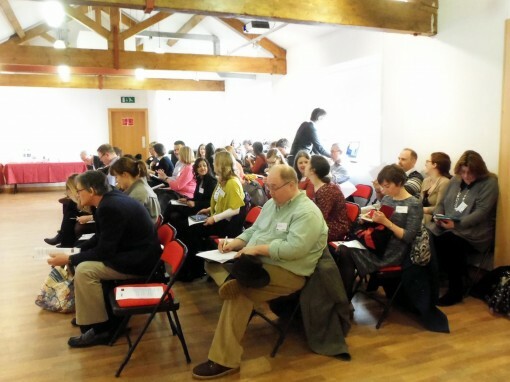 Workshop participants at Foyles on February 15 await the session's introductory comments. 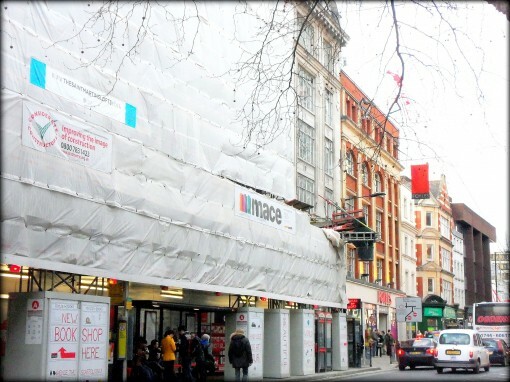 Foyles is to move next door into the more capacious former St. Martin’s College of Art space. At first glance, this suggests that the old rooms-and-rooms-of-books-and-books format is yielding no quarter. The new digs (to open next year) might mean simply more floor space across which to fling that “six-and-a-half kilometers of books” touted by print-lovers who fear the ebook storm troopers are about to burst in and confiscate their cookbooks. As it turns out, the reality is more complicated. Noisy, too. The last quiet moment anyone can remember from Friday’s session is Foyle’s chieftain Sam Husain, making a soft-spoken, gentleman’s welcome to the group before handing off to Robinson and Alex Lifschutz, he of Lifschutz Davidson Sandilands, architects. Lifschutz barely held off the cheery cacophony of the brainstorming summit, himself, long enough to show some archival slides to us, wave some floor plans and elevations at us, and — with well-placed bias — remind us that as Beirut was once the Paris of the Middle East, Foyles was once the Montmartre of London’s bookselling business. 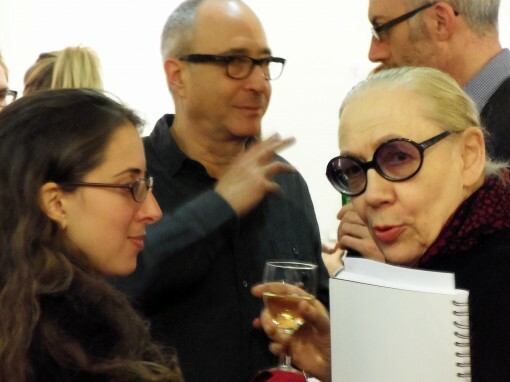 Foyles' Miriam Robinson, left, talks with Covent Garden Area Trust and Ambassador Theatre Group board member Christina Smith. Behind them, center, is architect Alex Lifschutz. I’d just walked down Denmark Street, in fact, on my way from Lincoln’s Inn Fields, and here was one music shop after the next jammed with instruments, sheet music, photos of visits by greats and near-greats, bars celebrating the sweetest sounds of decades. Denmark Street is every bit as chaotic and bohemian as a literary ghetto might be alphabetized and wholesome, were Foyles to try — note my verb, try — regaining that hub-hearty approach in its new incarnation. And the roar of Robinson’s round-robin of ideas on Friday was so upbeat and summer-campy that it may seem sacrilege of me to suggest that the future home of Foyles might not come-hither its fans as easily as do those grungy little guitar stores. Foyles is a very big independent store groaning as the marketplace hovers daily higher above the high street, in cyberspace. It has its flagship corner location in Charing Cross and, by my count, five other locations, the farthest afield in Bristol. Exactly as with bookstores in the States, its business isn’t walking away, it’s clicking away. Londoners are shopping in Seattle. Amazonia can outdo even Foyles’ reported stock of some 200,000 physical titles. And Amazon delivers. And Amazon offers great prices. And Amazon has achieved stunning heights of customer service. We all know this story. So back at ground level, if you give them great sandwiches and colorful markers, bright, engaged, attractive members of London’s publishing community will convene and have a high old time shouting “a bar on every floor!” and “world-class toilets!” to each other, as they did last week. They’ll eagerly help you, in other words, try to think of super ideas for Foyles’ “bookshop of the future.” And God bless them, every one, for the zeal they brought to their red-draped tables, I salute them and was honored to be accepted by them during my visit. 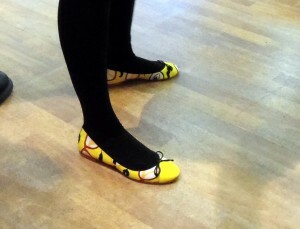 Post-sensible shoes on Miriam Robinson of Foyles. But there are real, systemic, new-era dilemmas here. And, safely back in the States, I’m too far from Foyles for the dynamic, charming Robinson to chase me down Shaftesbury Avenue in her marvelous yellow shoes. So I’m going to wrap myself in the Ether now and point out that — as much as I loved the ebullience of the Foyles workshop — it did not, at least on Friday, solve The Bookstore Problem. Now, don’t worry: Robinson is as tough a cookie as you or me. She knows perfectly well that a big “eureka!” didn’t land in the middle of the room. And this does not mean that Foyles won’t arrive in its new space, happy and glorious, long to reign over a new wrinkle in bookselling for eons ahead. All might be well. Or not. 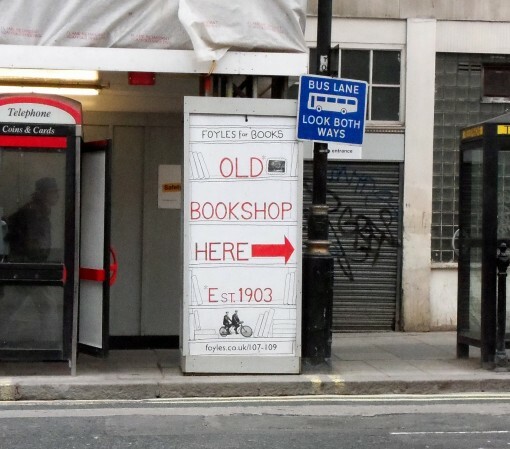 And I want to tell you about how things played out when these savvy folks—who do know The Bookstore Problem—took Foyles up on its smart bid to think before it dives into the new spot. 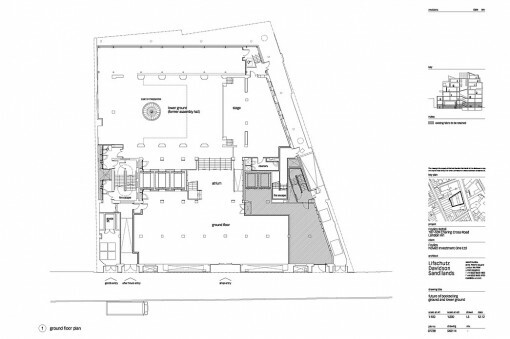 The Foyles workshop teams were supplied with floor plans from architects Lifschutz Davidson Sandilands. Booksellers have praised the Foyles bookshop workshops as “inspiring” as the company said it was preparing to sit down with architects and plan the new store…Foyles’ head of marketing Miriam Robinson described the workshops as “inspiring” and said she was looking forward to compiling a detailed list of all the suggestions for the new store based on the ideas generated from across the two days. I particularly like the fact that the canny Robinson next will present to the public, via Foyles’ site, a selection of the many ideas that were whipped up in the room during the total twelve hours of workshopping — by what I’m guessing approaches some 200 participants overall. It’s good to expose to the public to this process, and, by association, The Bookstore Problem. Who isn’t tired of the dumb-as-a-post book shopper who seems to know nothing about the plight of the industry that he or she patronizes? Whatever Robinson and her folks can do along the way to help the wider community understand what a struggle this is, I’m all for it. 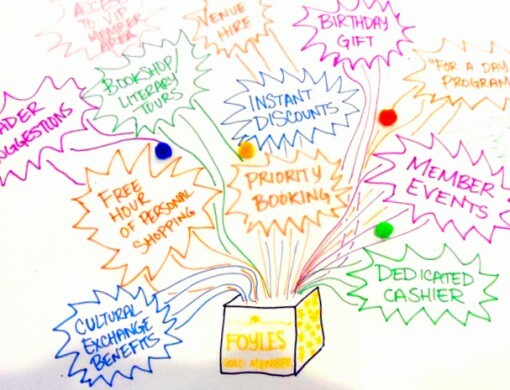 One team at Foyles' "bookshop of the future" workshop on Friday illustrated for the rest of the group some of the customer benefits that might be included in a bookstore membership. (1) It’s easy to forget the books, and curiously alluring to imagine all sorts of other attractions. You’ll see me fall into this, myself, in a bit below. (2) Bookstores may not be doing what we think they’re so good at doing. We’re going to keep going a bit on this topic in this edition of Ether for Authors because Robinson’s good effort at Foyles deserves it and because there are not-so-subtle elements of this story, the bookstore and natural selection of the marketplace that have to do with so much that we discussed in New York last week at O’Reilly’s formidable Tools of Change Conference, at its all-new Author (R)evolution Day, and at the preceding Book^2 Camp, the “unconference” that annually precedes TOC. No, no one suggested having a Cirque du Soleil team flipping around above the YA section. But close. There’s an atrium space forming the new building’s core and a beautiful display of social media messages about the business of Foyles could be devised as a luminous, living annunciation of the sales being made at cash registers, purchases tweeted out onto the Ether and sent spinning up into vault, very cool. As long as one’s name isn’t necessarily attached to what one just bought. Even reachier, how about a Minority Report-like screen on which one sorts through books and makes purchases? They arrive (maybe printed-on-demand?) with a great, pneumatic-dramatic “shump!” noise, as one’s new read is churned out by the mighty apparatus. But, of course, the effectiveness of store windows has a lot to do with pedestrian traffic. And pedestrian traffic in our urban settings these days has even more to do with routine. One walks to and from work or school or shopping, frequently by the same route. And so boffo window displays may have a more limited audience than might be needed to make the time and labor that went into them pay off. No small amount of workshop discussion went into the idea of large, inviting window displays on this sidewalk once the new Foyles location is open. In fact, generating physical visits to Foyles as a destination is clearly one of the toughest challenges the company shares with its sister bookstores everywhere. The more powerful Internet commerce becomes, the harder it is to get a body into the shop. To this end, I spent some time talking about the idea of having a top-notch performing-arts space installed in the new facility, and made permanent home to several of London’s smaller, professional arts organizations — for consistency, regular performances and seasons would replace the usual patchwork of one-off events: Foyles as cultural destination. But notice that in talking about this concept, I, too, had wandered away from books as the central factor. You can array any number of book displays around a given modern-dance or theatrical event or concert. But how long will it be before the reason they’re coming to the store shifts to the events, not the books? Does that matter? Probably it does. One of the most energizing defiant-slogan-style statements to come from a group at the workshop was this: “You won’t find it in other stores and you sure as hell won’t find it online.” The only problem with that? “It” probably isn’t books. In fact, “it” wasn’t defined. “The experience!” everyone shouts with passion. But what experience? The un-books-ing of bookstores has been under way for a long time. Robinson, in fact, had very logically listed “diversification” of products — meaning giving shelf space to things that aren’t books. But, as we know, regular bookstore shoppers, at least in the U.S., are getting increasingly put out at “related merchandise.” I’ve seen some really spirited comments disparaging this trend toward your bath towels with Virginia Woolf’s face on them and your deck chairs with Papa Hemingway’s signature on the back. One group, wisely, tried envisioning a specific customer, unmarried but with children. 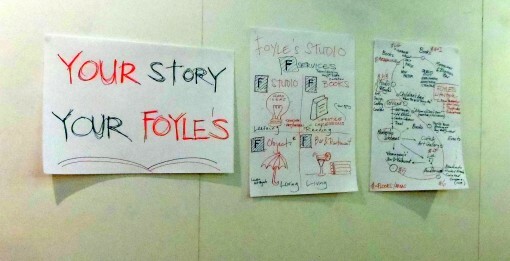 #FutureFoyles: “What Bookstores Do Best” — or Do They? Perhaps where my new friends and colleagues at Foyles will be least happy with me is in this little section of the column, because I think it’s important to get something on the table more honestly than we sometimes do it. 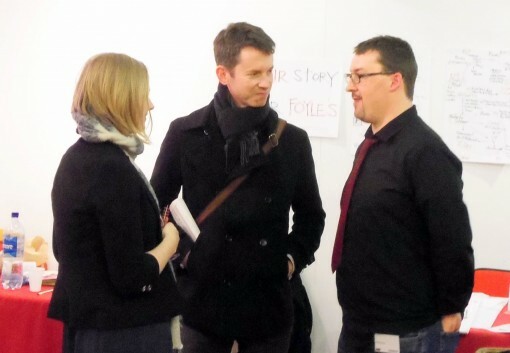 At Friday's workshop, The Bookseller's Philip Jones, right, talks with Simon Bowers of The Guardian and Laura Norton, of Colman Getty, which works in public relations with Foyles. This came about because in trying to stay closer to suggestions involving books, I’d recommended personal shoppers—being able to ring up the store, get your associate on the phone and tell him you were on the way and you needed to see the latest Peppa Pig books for a niece. Or tell him you were going to need a recommendation of a good dystopian classic to read after you finished the Wool omnibus. That human link of the legendary hand-selling that’s said to go on at bookstores could only be made better, I reasoned, if a specialist were dedicated as “yours” and standing by with well-researched recommendations and some bold new finds for you. To my mind — and despite the cost of a staff able to offer this level of personalized service, maybe at the top tier of a membership program — one of the important points of this is that it is about the books. I wouldn’t expect my personal sales associate to hand-sell a new coffee to me from the café. I’d expect books, well recommended and reflective of a growing understanding of my tastes. The group joined this lead colleague, however, in sadly agreeing that robust service-on-the-hoof isn’t probably in the offing. If indeed this kind of knowledgeable relationship with a seller of books ever has existed for many readers at a store, the idea of it coming to the fore now seemed as unlikely as my joking suggestion of a swimming pool in that Foyles basement area. If anything a “we can get you any book” initiative, suggested by one group member, was built on the assumption that Foyles is going to have to ally itself with one or more major Internet retailer. Such as Amazon. 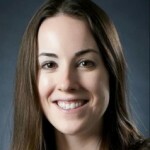 Because physical inventories can’t match the reach of aggregated virtual selections. Efforts to “beat Amazon” at anything but the in-person capabilities of a terrestrial store seemed accepted as futile by most workshop participants I encountered. And so, once I’d left Foyles on Friday evening, the hubbub behind me and my online flight reservations and 3G unit return and Heathrow Express bookings and correspondence and writings all glowing at me in the dark, it finally came into sharper focus: If any bookstore, not just Foyles, isn’t able to create that expensive, painstaking appeal of a collaborative human touch at the shop, then all the chandeliers and escalators and bistros and jazz bars and children’s grottos and adults’ meetups (I’d told them a bit about the Museum of Modern Art’s success) and flashing lights and fashionable windows and cultural events and membership perks won’t save them. Put another way, I’m willing to give up the second- and fourth-floor bars to pay for more sales associates who actually know the inventory and their customers. Service. Service. Service. Once more for good measure: service. Boots on the ground, when it comes to book shopping, are only there if they get something more personal than the online experience. Which, otherwise, already has won the war. One overriding theme was that bookshops need to become more dynamic, to have the ability to curate their shops around prevailing moods, or types of shoppers, to bring teen titles to the fore at the weekend, but promote adult reads during the working week. In a sense, to bring the flexibility of a website to the shop floor. Some hardened retailers might grizzle at the prospect, but it gets at something that is becoming increasingly important: having a beta attitude. I’ve said recently that the industry is coping well with the digital shift, evolving and in some cases leading. But are we prepared to look beyond our comfort zone? We have made print books into digital books, but the way we sell them and the business models that underpin the industry remain largely unchanged. We now need to challenge ourselves to take the next step even if it might be a misstep—trial and error. I hope to stay in close touch with the Foyles/Bookseller push. If there’s a chance to move The Bookstore Problem down the road at all, right now that road is Charing Cross. Note: If you’d like to review tweets from the two workshops and other media being uploaded around the session, see the Epilogger I have running on the events here. Please feel welcome to add related posts or media to it. In related reading: indedpendent bookseller Jenn Northington writes What Aren’t Bookstores Doing? at BookRiot, in response to her experience at Book^2 Camp, a conference held in New York just a day before the first Foyles workshop. Jason Allen Ashlock of Movable Type Management and Eve Bridburg of Grub Street in Boston spoke at Author (R)evolution Day, produced by O'Reilly's Tools of Change and Bookigee. 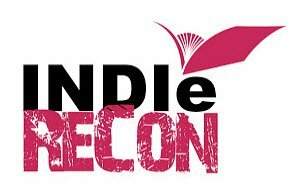 It’s an all-day series of talks for authors about what’s going on with the publishing revolution. Tools of Change is mainly for the publishing professional and the type of content and the cost of attendance are not aimed at average authors. Having received some criticism for this, today is the first attempt by O’Reilly to cater to authors and provide them a forum that is affordable. Most every seat was sold out. I noticed that the majority of people were taking notes. The presentation was designed to have no bias about self-publishing vs regular publishing and the goal was to give all authors some aid and guidance. Disintermediation jettisons people from their usual roles: readers writers, publishers, distributors. What happens when the disintermediation is so complete, when all intermediaries are kicked out and only the writer and reader remains? The new rules aren’t rules, they change consistently. The publishing revolution has created radical disintermediation then you need an agent who offers radical advocacy – get the work into the hands of readers/viewers. And comments following my Extra Ether: A Good Day for the (R)evolution have been interesting, with comment from Roxie Munro, author C.J. Lyons, Victoria Noe, Bob Mayer and others. 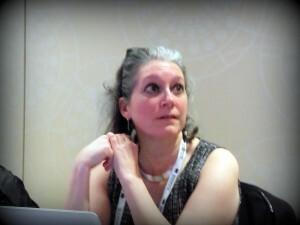 Bowker's Laura Dawson spoke on metadata at Author (R)evolution Day. Not only is it time for authors to take control of our own careers, we have the opportunity to grow our own global empires (something I recently blogged about) via strategic partnerships. Conferences like TOC are providing a wonderful service because they are agnostic about genre, fiction v. non, and self-published v. traditional publishing. And in terms of the disintermediation question, she adds an ironic turn from personal experience. 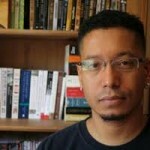 I was recently turned down for speaking engagements at several well known conferences because I still partner with NYC publishers and the organizers felt their audience wanted “pure” indy authors as speakers rather than someone like me who has experience across the publishing spectrum, so the discrimination has now come full circle. 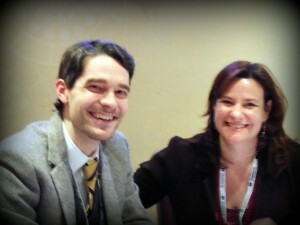 Note: An Epilogger account here is gathering material from both #TOCcon (Tools of Change) and #ARDay the (Author (R)evolution Day). Please feel welcome to add related posts or media to it. March 6-9 Boston: AWP, the Association of Writers and Writing Programs: AWP last year drew 10,000 attendees to icy Chicago, and, per its copy on the site this year, AWP “typically features 550 readings, lectures, panel discussions, and forums, as well as hundreds of book signings, receptions, dances, and informal gatherings.” The labyrinthine book fair is said to have featured some 600 exhibitors last year. The program is a service-organization event of campus departments, hence the many readings by faculty members. April 5 New York City Writer’s Digest Conference East Boot Camp: Join me in a participatory special-focus workshop, Public Speaking for Writers: How To Turn Your Readings Into Book Sales. Learn what a public reading is really about; what an audience wants from an author at a reading and how to give it to them; how to choose what to read, rehearse it, prep your listeners (it’s not about “setting the scene”), and how to present yourself to your audience. Bring a couple of pages of a manuscript, we’re going to get you up on your feet for this one. (Note: The Writer’s Digest Conference Boot Camp sessions have an additional charge, check for details.) Registration is open, information is here. Live-tweet coverage from this conference. April 5-7 New York City Writer’s Digest Conference East: Author James Scott Bell, who knows the value of coffee, gives the opening keynote address this year at “one of the most popular writing and publishing conference in the U.S. Writer’s Digest Conference 2013 is coming back to New York at the Sheraton New York Hotel. Whether you are developing an interest in the craft of writing, seeking an agent or editor and publisher for your work, or a veteran hoping to keep current on the latest and best insights into reaching a broader readership, Writer’s Digest Conference is the the best event of its kind on the East Coast.” (Note that this year’s hashtag is #WCE.) Registration is open, information is here. Live-tweet coverage from this conference. so ramped up from the discussions today at #toccon I had to walk (55 blocks) home to calm down. @virtualdavis @danblank @porter_anderson TRAGIC lack of chocolate at #ARDay. Somewhere between the Book^2 Camp on February 10 and Tools of Change, February 12-14, some interesting dialogue came up around that big-deal buzz bugaboo, discoverability. Seemingly a bit of a breakthrough in thinking — at least in its potential to ease the angst on the part of readers — came through from the Book Camp sessions. Getting average readers to be interested in book discovery — getting average readers to visit Bookish, for instance — is going to be difficult, because you are also going to have to require these people to make big shifts in their behavior and in their media consumption patterns. Are these people really not reading more because they don’t know what they should read? Maybe. But it’s more likely that they have plenty of things they’d like to read, and just don’t have time, or, like me, there are other forms of media that they care about more than books, and if they were to shift into reading more books, they would have to give up things they really like instead. This turn of thinking was framed by Guy Gonzalez and Rebecca Schinsky to point out that discoverability is really the problem not of readers but of publishers. 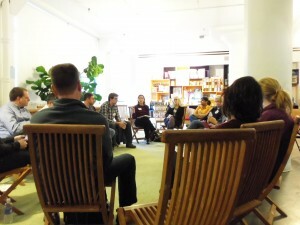 Book^2 Camp was held in New York on February 10, just before Tools of Change opened. Never mind the folly of dismissing Goodreads, a social network dedicated to books with 13m+ members and steadily growing, or even Pinterest, where Random House has inexplicably attracted 1.5m followers, but the very idea that “something is really, chronically missing in online retail discovery” is arguably contradicted by Amazon’s 2012 results, suggesting that “online retail discovery” isn’t really a problem for readers. It’s a problem for publishers. In general, I like the thinking in these recent commentaries. We still need good books to be discovered, but it’s helpful to bear in mind that this is not, in all likelihood, as big a hurdle for readers as it is for the industry! the industry! And in one marvelously contrarian take, Chris McVeigh weighs in at Sam Missingham’s The Bookseller blog site, TheFutureBook blog site with the perfect Ether-ending headline: If you’re in marketing, kill yourself now. Well D’uh. Quelle surprise mes amis. What you gonna do for your next trick? Knock up a few hundred words on the pope being a catholic? (he is still a catholic right?) Of course discoverability is a publisher problem not a reader problem. That doesn’t mean it’s not a problem. Discoverability is a problem for publishers precisely because it’s NOT a problem for readers. There are so many books, so many places to buy them, so many routes to the checkout, so many subtle nudges towards choosing a title – the fact is, what remains is that publishers need to find some way of getting their products in front of potential customers. The problem with the discoverability debate is that it’s often been framed the wrong way around. The real discoverability problem for publishers is how to they can discover their audience, not the other way around. Those of us who daily spell discoverability — and sigh as spell-check tells us it’s not okay—probably enjoyed the Book Campy diss of discoverability while it lasted more than some others. McVeigh, for his part, isn’t laughing. I’ll let him play us out here at length. I like the voice. And I’ll see you next time. It’s taken this long to get to the point where publishers are finally beginning to take discoverability seriously. As an industry we genuinely can’t afford to slide backwards. Other players are about to enter the market, players who don’t operate in abstracts but operate with huge data sets and an eye for making a buck. Publishers who aren’t prepared, who haven’t built themselves strategies based around discovering their audiences will be swept away. If you don’t take steps to discover your audience, someone else will. Don’t get distracted people. Seriously. I looked at the first three months of my Twitter archive. I’ve never been so bored. You all should’ve ignored me from the get go.